Waiatara has an interesting story. 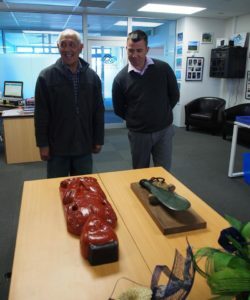 He was carved by Uncle Bevan Taylor as the tekoteko for the waharoa at Boundary Stream. He was stolen soon after. Uncle Bevan then carved a replacement. 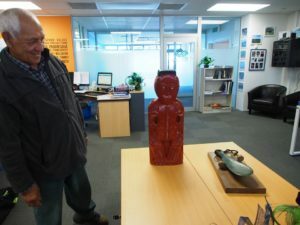 Waiatara was missing for years until last year, he reappeared at Opouahi. DOC returned him to us and Uncle Bevan repaired him. Waiatara will be in our tari where he can look out to Maungaharuru and watch over the kaimahi, our Hapū and the mahi that we do.